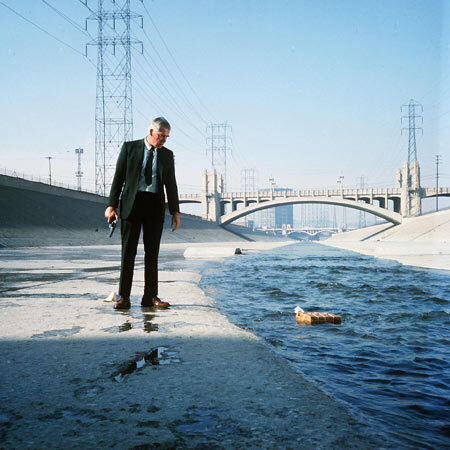 Point Blank (John Boorman, 1967) – Rhythmic Footsteps and Diegetic Power. What is the best way for a film to show the power of a character? Is it to retain the power within the narrative world and show it be all encompassing, or is it better to show it to have control over specific qualities of the medium itself? One of the best examples of this debate to be realised in cinematic aesthetics is in John Boorman’s 1967 film Point Blank. This isn’t just an excellent example because of how effectively brutal the lead character is shown to be, but how the way his power is presented hints at questions about the film’s narrative reality far beyond that of the norm of the film’s genre. Point Blank follows a wronged criminal who seeks revenge for a job that he was betrayed over. On his journey to finding the money he is owed, he visits different people from his past and resolves the underlying issues surrounding their double-crossing nature. Unlike other films of this ilk, the reality of the film (a hazy San Francisco in the late sixties) is ambiguous and daringly so. Walker, played with robotic precision by Lee Marvin, is extremely violent but is also knowingly aware of the questions surrounding his very existence. Point Blank is therefore one of the few crime films that openly questions Existentialism. However, one scene in particular sticks out from the film visually and aurally in presenting its main character as someone so undeniably powerful that he affects the aesthetic logic of the film. It also enhances the idea that Walker is someone who is more unusual and unnatural as a living person in the narrative world of the film; perhaps even a ghost or someone sent back from purgatory. The scene in question shows Walker on the hunt. He has just got the information as to where the girlfriend and man who betrayed him all those years ago on Alcatraz now live. A montage is put together to show the physical journey to the apartment but also for a number of other creative reasons as well. The first shot is one of the film’s more famous images; that of Walker quite literally living up to his name, striding down a long, colourful corridor. Is this the image of a dead man dreaming a last dream of revenge before the reality of the betrayal takes him away? He seems too overtly physical to be a ghost and this idea is presented aurally as well as visually. From Walker’s footsteps, a constant rhythmic stride begins to hypnotize and daze as if it is some mental metronome signifying the constant nature of the character’s determination. The shots cut away to other images; some showing the new life of Lynne (Sharon Acker) to be an empty, hollow one of unhappy self-indulgence and pampering. Yet, with these images of a Lynne wandering around in a catatonic state, Walker’s steps are still heard. The sheer power of the character means that they become more than just diegetic sound but something more unusual – something outside of the narrative reality of the film. All of a sudden the music begins to respond to Walker’s footsteps, playing in time to their rhythm as if obeying the stronger of the wills. This perhaps reflects the relationship between Boorman and Marvin: the former being in awe of the magnitude of the star helping with his film, the latter taking a chance on a new young talent with impressive ideas. The fact that the nondiegetic music seemingly succumbs to Walker’s rhythms not only suggests that the filmmaker is at the mercy of this unstoppable force but that the character is in fact a predetermined entity; in other words, if the filmmaker can’t stop him, what chances do the characters have? Other intriguing aspects appear within this scene as well. The sheer will that fights against the narrative logic of the montage feels powerful but also feels artistic. If filmed by a more art-house regarded director, the musical traits within the scene could be construed as Musique Concrète. The clash between this aural signifier and the visual stop-start nature means that it actually becomes more than just sound art. Even when Walker is shown to be sat in his car waiting outside the apartment (before he bursts in with unstoppable speed and hypnotically fires rounds into his enemy’s bed), the sound of the steps continue. This means that the sense of movement and journey is still present within the scene in spite of the fact that Walker is shown to already be at his desired destination; an apt final moment before the sound does cut out and he genuinely does stop to sit down and reassess (or perhaps even reprogram) for his next move. This disparity lends Point Blank a sense of surrealism and makes it a crime film that clearly has more beneath its surface than just a desire to show action as a means towards wealth. Walker therefore comes off as a character who is in total control of his situation, not simply because he is dangerous to the other characters in the narrative world, but because he commands total control that extends outwards to exert influence on the very medium responsible for bringing him into existence. The Music of Folk Horror – Part 2 (Folk Horror Chain and Witchfinder General). Tales of Mystery (1961-1963) – What Was It Like? (Algernon Blackwood).